14 points including 2 horizontal front points for ice climbing, ski mountaineering and glacier hiking, etc. Stainless steel rivets for linking, rust-free and durable to use. 1 * Carry Bag Note: Crampons ONLY, shoes displayed in pictures are NOT included. 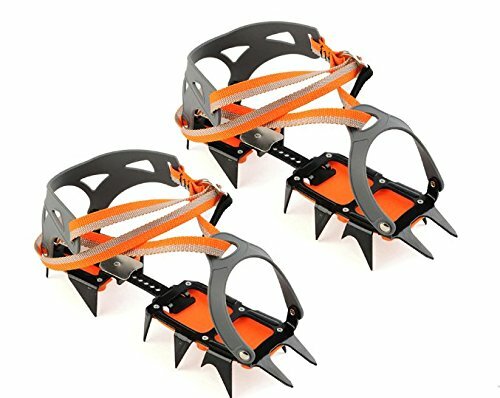 Crampons are tested at the elevation of 6000M, so they can at least be used on the high altitude less than 6000M. Manganese steel frame and TPU binding system. Semi-rigid frame with its flexibility allows a degree of shock absorption and a greater resistance to strain. An adjustment linking bar for a secure fit for footwear of EU 36-45. Anti-balling plates to prevent snow from sticking to the bottom of the crampon. Universal and strong binding system for maximum versatility and fits most boots. If you have any questions about this product by FTK, contact us by completing and submitting the form below. If you are looking for a specif part number, please include it with your message.